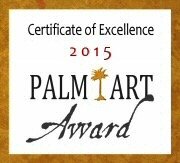 PALM ART AWARD 2015 The Winners have been chosen! On sunday the 21nd of mai a privat exhabition was held at Heiloo. The Galery was also the setting of the presentation of the copy of the book "Nederland kan zo niet langer", written by Gerrie Hulsing, to Tweede Kamerlid and former minister Hilbrand Nawijn. fltr. Gerrie Hulsing, Hilbrand Nawijn and Ine Veen. On friday the 28th of april 2006 Ine Veen was knighted. She received the decoration in the Order of Oranje Nassau. A biography on Ine Veen by Adrian Stahlecker. Ine Veen and Hilbrand Nawijn, former minister and member of the "Tweede Kamer"
Ine had a meeting with Hilbrand Nawijn on oktober the 5th in the "Tweede Kamer" at Den Haag. In august 2005 the painter/writer Adrian Stahlecker started to write a biography on the life of Ine Veen. The book wil, as soon as it appaers, astound you. You wil read that Ine was born out of a love relation between her mother and the famous director, composer and writer Gerard van Hulst. (see Wikipedia). The fact that Gerard van Hulst is Ine's "biological" father, makes her a bloodrelative of the well known CHU en CDA politician dr. J.W. van Hulst, who was member of the "Eerste Kamer", chairman of the CHU/CDA fraction in the "Eerste Kamer" and a member of the European Parlement (period 1956 - 1981). Maybe that explains why she is interested in politics. The biography on Ine Veen wil have as title : "The muse Ine Veen". The famous dutch journalist Henk van der Meyden wrote a striking foreword. No wonder, because in his column "Privé" in the newspaper "The Telegraaf", over the years he wrote several times about her.